SoundLink® Revolve, the best-performing portable Bluetooth® speaker from Bose, is engineered to spread deep, jaw-dropping sound in every direction. Place it in the center of the room to give everyone the same experience. Or set it near a wall and sound will radiate and reflect around the room, immersing you in that same feeling you felt at your favorite show. The tapered cylindrical shape with a flexible handle makes this wireless speaker easy to grab and go, while durable aluminum body provides worry-free protection. And it's water-resistant so you can keep the party going, even if it starts to rain. The rechargeable, lithium-ion battery plays up to 12 hours-for full-day listening. Voice prompts talk you through Bluetooth pairing, and there's a built-in speakerphone for calls. Use the Bose® Connect app to pair two SoundLink®, speaker for Stereo or Party Mode. The app also helps you manage your devices, unlock features and access future updates. 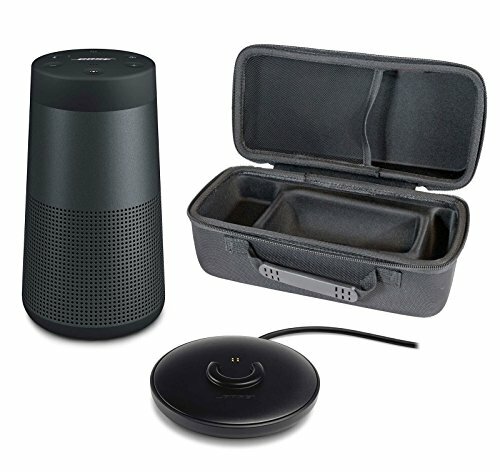 The Portable Hardshell Case comfortably fits Bose Revolve and a spot for the charging cradle (sold separately), and is ideal for your daily travels or for your holiday getaway!